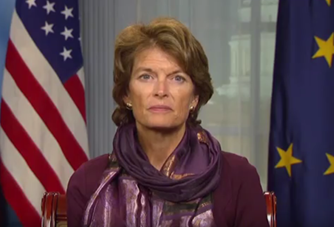 Senator Murkowski, up for election this fall also took the opportunity to hit on familiar campaign talking points, the need to expand domestic energy resources, improve VA care to veterans, and the failure of Obamacare. “The President claims to have unleashed our energy sector. To the contrary he’s placed a stranglehold on American resource production while unleashing the Iranian energy sector. Our President should be focused on increasing the domestic energy production that has created the jobs, greenhouse gas reductions, and low gasoline prices he trumpeted. In Alaska, we have seen the federal government consistently block offshore energy production, lock up energy resources in ANWR, and ignore opportunities for investment in the Arctic — hurting job creation and economic development in the state. We’ve see the federal government block increased timber production in Southeast where communities have been devastated by the federal government’s failure to responsibly manage our state’s national forests. “The President claims that his administration has delivered ‘more care’ to veterans. Over the past year and a half we have not seen an improvement in the delivery of VA care in Alaska. This needs to change. “The scene isn’t any better when it comes to national security. While President Obama claimed that ISIS was the ‘JV’ team and was contained, we are seeing that its hold in the Middle East is growing. Coupled with growing threats from North Korea, Iran, and Syria, the administration is way out of step with the challenges facing the world today. President Obama bragged about all of the progress we’ve made with Iran, and yet just today Iran detained ten American sailors. “President Obama continues to believe the false reality that the Affordable Care Act is living up to its promises–and especially for Alaskans. Whether losing their insurance plans, being forced to switch doctors, or facing ever-increasing premium costs, Alaskans are living in the reality that the Affordable Care Act is far from affordable. Murkowski is chairman of the Senate Energy and Natural Resources Committee and the Interior Appropriations Subcommittee. “I’ve always appreciated President Obama’s considerable oratorical skills. Tonight, I was heartened that he spent some time highlighting what’s good about our country and emphasizing America’s unique optimistic spirit. We can never forget that for our resources, our hardworking citizens, our collective big heart, and our form of government, we are truly the envy of the world. I also appreciated his call at the end of his speech to work together. “But I was disappointed that he wasn’t straight with the American people about the challenges we face. This Administration has overseen one of the slowest recoveries in history. Since President Obama took office, our gross domestic product only grew at a little less than 2 percent, hurting middle class families. Incomes are down. Today, 15.7 million Americans are unemployed, working part time because they cannot find full-time employment, or want work but have stopped looking altogether. The national debt in 2009 was $10.6 trillion. Today it’s $18.9 trillion. “And opportunity in this country is being increasingly stifled by a federal government that believes it needs to regulate every aspect of business and American life. The President’s vague reference to increase costs of the energy industry signals that he wants even more regulation. “In short, it appears that this President truly believes that growing government–at the expense of individual freedom and ingenuity–is the proper way to structure our society. I fundamentally disagree. I believe that the creative fire, fundamental to each individual, is stamped out when government dictates the boundaries of success. We should always remember that people, not bureaucracies, are what made this country the greatest in the world. “Leadership in foreign affairs and national defense is also severely lacking. The world is a more dangerous place than when the President took office. ISIS, which launched another attack in Turkey today, is a lingering and increasing threat. Huge swaths of Iraq and Syria have descended into chaos. Libya and Yemen are becoming failed states. Russia is provoking us at every turn, including in the Arctic. China is building islands illegally in heavily trafficked international shipping lanes. North Korea may have just tested another nuclear device. Given all of this, the President is still planning to make the mistake of cutting our military forces in Alaska and elsewhere. “Further, we are on the cusp of giving Iran, the world’s largest state sponsor of terrorism, a huge economic boost, sure to assist them in their drive to achieve hegemony in the Middle East. Remember, this regime regularly chants “death to America,” and has refused to release the five Americans it is holding hostage–some of them for years. And just today, conspicuously absent from the President’s speech, Iran took U.S. sailors hostage and accused them of spying. Congressman Young sharing his thoughts following the 2016 State of the Union (click here to watch). “Hello, I’m Congressman Don Young. I just spent an hour and five minutes listening to one of the — I think — most discouraging speeches I’ve listened to in the State of the Union addresses. In the prior announcements, the President said he was going to have an upbeat speech about the future. I think it was a lecture of his vision. And because we haven’t acted on it, he believes we’re wrong. I think we’re right. And that’s the Congressional position to have because we’re elected by the people and we represent the people — not the king. 1 Comment on "Alaska’s Congressional Delegation Reacts to the State of the Union Address"
Thank you for perhaps the most level headed thing I have read today. Cool to read such a well-considered article! I mostly use https://goo.gl/Ur6CFh to edit my PDFs. I think it also allows you to to create fillable pdfs and esign them.